On the January 5 edition of Christian Broadcasting Network's (CBN) The 700 Club, host Pat Robertson suggested that Israeli Prime Minister Ariel Sharon's recent stroke was the result of Sharon's policy, which he claimed is "dividing God's land." Robertson admonished: "I would say woe unto any prime minister of Israel who takes a similar course to appease the EU [European Union], the United Nations, or United States of America." Although Robertson professed that "Sharon was personally a very likeable person," he nonetheless declared that "God has enmity against those who, quote, 'divide my land.' 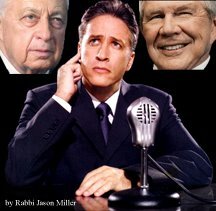 "
I think Jon Stewart set the record straight on the January 5 edition of "The Daily Show" when he showed a photo of the portly Ariel Sharon and surmised that the actual reason Sharon had a massive stroke was because of "fat, age and stress." ROBERTSON: I have said last year that Israel was entering into the most dangerous period of its entire existence as a nation. That is intensifying this year with the loss of Sharon. Sharon was personally a very likeable person. I am sad to see him in this condition. But I think we need to look at the Bible and the Book of Joel. The prophet Joel makes it very clear that God has enmity against those who, quote, "divide my land." God considers this land to be his. You read the Bible, he says, "This is my land." And for any prime minister of Israel who decides he going carve it up and give it away, God says, "No. This is mine." And the same thing -- I had a wonderful meeting with Yitzhak Rabin in 1974. He was tragically assassinated, and it was terrible thing that happened, but nevertheless, he was dead. And now Ariel Sharon, who was again a very likeable person, a delightful person to be with. I prayed with him personally. But here he is at the point of death. He was dividing God's land, and I would say woe unto any prime minister of Israel who takes a similar course to appease the EU, the United Nations or United States of America. God said, "This land belongs to me, you better leave it alone."